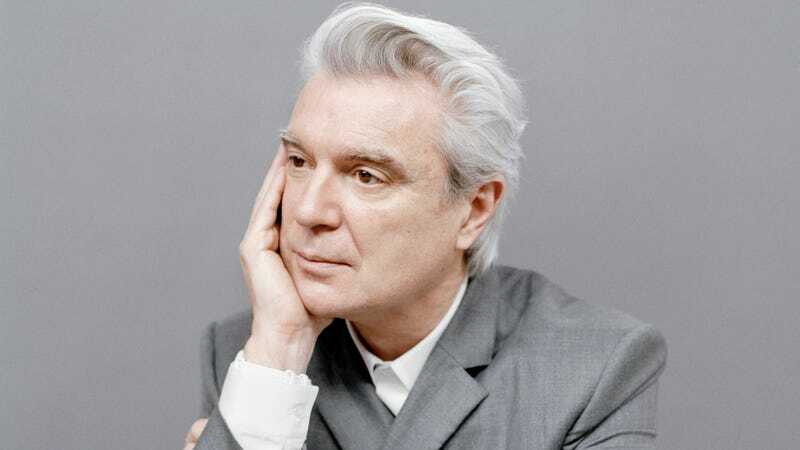 For the past year, Talking Heads co-founder, True Stories director, and player of buildings David Byrne has been assembling Reasons To Be Cheerful. Like the Ian Dury song for which it’s named, the unabashedly optimistic survey of contemporary life sees the troubles and anxieties of our age and responds with media-spanning motivations for putting up with it all. During a presentation at the New School today, Byrne announced a reason to be cheerful of his very own design: American Utopia, his first solo album since 2004’s Grown Backward. That’s not to say Byrne’s been musically inactive during that period, having recorded albums with Brian Eno, Fatboy Slim, and St. Vincent over the past 14 years. Nor is it to say that American Utopia is lacking for collaborators: The itchy, upbeat preview track, “Everybody’s Coming To My House” was co-written with Eno, and features contributions from Sampha. It’s all in the paradoxical, contradictory spirit of mounting a project called Reasons To Be Cheerful amid the oppressive dreariness of 2017 and 2018, which Byrne addresses—with some characteristically rhetorical questions—in a statement about American Utopia. These songs don’t describe an imaginary or possibly impossible place but rather attempt to depict the world we live in now. Many of us, I suspect, are not satisfied with that world—the world we have made for ourselves. We look around and we ask ourselves—well, does it have to be like this? Is there another way? These songs are about that looking and that asking. This album is indirectly about those aspirational impulses. Sometimes to describe is to reveal, to see other possibilities. To ask a question is to begin the process of looking for an answer. To be descriptive is also to be prescriptive, in a way. The act of asking is a big step. The songs are sincere—the title is not ironic. The title refers not to a specific utopia, but rather to our longing, frustration, aspirations, fears, and hopes regarding what could be possible, what else is possible. The description, the discontent and the desire—I have a feeling that is what these songs touch on. American Utopia is out March 9, via Byrne’s Todo Mundo imprint and Nonesuch, and will be followed by a world tour, which Byrne describes as “the most ambitious show I’ve done since the shows that were filmed for Stop Making Sense”—which is saying a lot, since he just did this a few years ago.